The chairman of the American Chamber of Commerce in Korea on Wednesday asked the government to let U.S. firms join the newly launched Creative Economy Task Force. Assuring that U.S. businesses would continue business in Korea as usual despite recent turbulence on the peninsula, AMCHAM’s newly appointed chief raised hope that American business representatives could contribute to the government’s creative economy task force to reach win-win solutions for both parties. 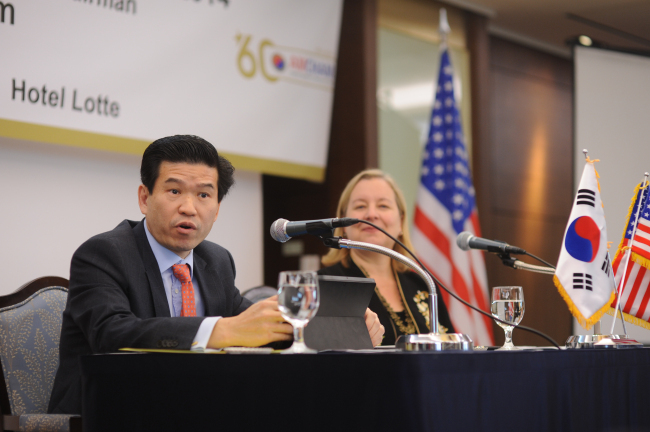 “American companies have unique expertise in fostering innovation and creating an ‘enabling environment’ for innovation, and we would be happy to continue to share these with Korea,” said AMCHAM chairman James Kim at a press conference held in downtown Seoul on Wednesday. Kim, the country manager of Microsoft Korea, was referring to the task force announced by President Park Geun-hye on Jan. 6 and established on Tuesday. The team, comprised of representatives from the public and private sectors, is aimed at creating synergy between the two segments. “I think it is important to know that Korean companies have also been very, very innovative. And through the task force, I think American companies and the U.S. could also learn from Korea. We can have a truly win-win partnership,” he said. Asked about other suggestions that he wants to propose to the Korean government, Kim said that when new policies are introduced, they must be carefully designed to allow for feedback and input from all stakeholders in a transparent manner before being implemented, and that joining the task force is crucial. The leader of the largest foreign business chamber in Korea, with around 1,800 individual members from almost 900 member companies, said AMCHAM will launch its Innovation Luncheon Series this year and invite key speakers from both countries who are innovation leaders in their fields to highlight ways to further promote innovation in Korea. Kim, the first Korean-American AMCHAM head, said that his members are actively contributing corporate citizens of Korea, helping with job creation. “Most significantly, we were at the forefront of the efforts to get the Korea-U.S. free trade agreement launched, negotiated and passed by the legislature of both countries,” Kim said. Kim revealed that American businessmen are questioned frequently by their headquarters on why they should invest more in Korea, especially over bigger countries like China, Japan, Indonesia and India. “This is our job to ensure that we keep our positions in the headquarters in the best possible way,” he said.